The weather is changing...the bitter bite of winter is making its appearance. That means warms drinks start the day out. One morning I was going to make a Maple Bacon muffin but I decided to make a scone instead. First, you have to actually like scones, which for a lot of people, isn't so. 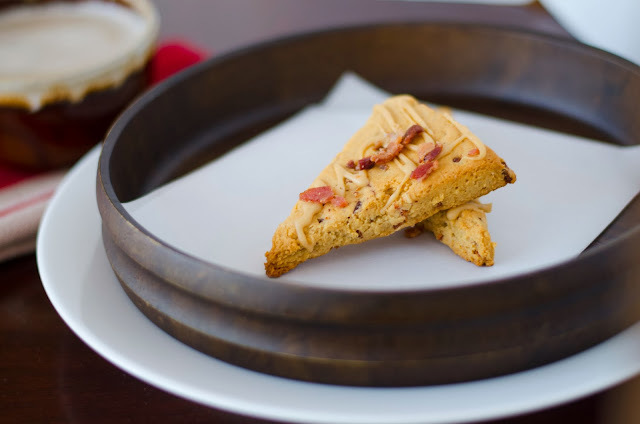 But you can't go wrong when said scone can be lightly dipped in a chai. Now that, my friends, along with an extra side of bacon, is a perfect morning. Anyway, I have a few friends who are my testers. The first one came by and gave them an A+. The second one was delivered three and texted me shortly thereafter to say all three were gone. And that is was the best bakery item I have ever made. Even better than my Samoa's and Cake Balls...WHAT? Anyway, there isn't much more to say when you get those kind of reviews. Oh yeah there is. And that would this....this was my first experiment and I nailed it. Sometimes even I amaze myself. And the second, I just wanted to brag a bit, show you the picture and then tell you I'm not even posting the recipe. But you can buy them from me if you are in Des Moines!